Before I get to the embarrassment of the nasty, bitter State of the Union display by the Democratic Party, let me lead with great news. First, the jobs front. Wednesday morning saw the release of ADP/Moody’s Analytics private payrolls report. New job creation exploded once again under President Trump. Businesses added 234,000 jobs in January versus an expected 185,000. Manufacturing added 12,000 jobs and construction 9,000 new jobs - in a traditionally slow month. WOW. Secondly, the numbers from Trump’s State of the Union. Fox News had the biggest audience for a State of the Union in the history of cable news. The old record of 6.5 million viewers was smashed by smithereens by Trump with an astonishing 11.7 million viewers. It was also the highest rated presidential address of any kind in the history of cable news. Now to the reaction from viewers. CBS took an instant YouGov poll. Here are the amazing results. 97 percent of Republican viewers liked Trump’s speech. 72 percent of independents liked it. Amazingly, 43 percent of Democrats liked it. Overall 75 percent of Americans approved of the speech. And a shocking 8 out of 10 felt President Trump was trying to unite the nation, rather than divide it. Two-thirds reported the speech made them feel proud. Which means anyone who isn’t a bitter, nasty, arrogant, hateful, Kool-Aid drinking socialist loved what they saw. Unfortunately, that leaves the entire Democrat Congress. That’s why I report the Democratic Party committed political suicide on Tuesday night. Their response to Trump’s speech was out of bounds. It wasn’t normal. It was hateful. It was bizarre. Actually, in a word, it was “foreign.” The Democratic Party is now a foreign party in their own country. They no longer have any understanding of what people born in America think or feel. It's perfectly fine to be respectfully opposed to the politics of one party or president. That's acceptable. That’s as American as apple pie. But that’s not what happened on Tuesday night. Democrats were outed as the party that is rooting for America's failure. Rooting against a booming economy. Rooting for misery, instead of prosperity. Rooting against job creation. Rooting against a booming stock market. Rooting against employee bonuses. Angry about the lowest black unemployment ever. Angry about the lowest Hispanic unemployment ever. Angry at the lowest female unemployment in 18 years. 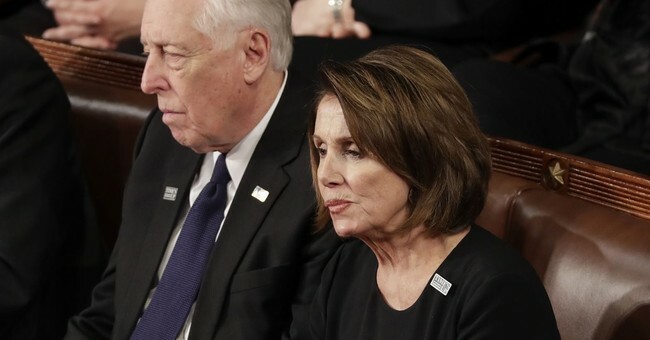 They openly frowned, grimaced, groaned and looked sick to their stomachs when President Trump celebrated the American flag…the national anthem… American freedom… and American opportunity. Bizarre. Self-destructive behavior. But wait it gets worse. Democrats appeared to be on the side of murderous MS-13 gangs. When Trump touted legislation to help stop gang violence, drug dealing and murder by vicious MS-13 gangs…and when Trump introduced the parents of two young girls murdered by MS-13 killers…Democrats booed and groaned. Democrats clearly believe discussing murders by illegal aliens is “racist.” Democrats clearly believe Trump has to be Hitler or KKK to publicly admit there are people of color (gasp) murdering innocent Americans. This was the second worst moment of disconnect in American political history. Now to the single worst disconnect ever. Amnesty-loving Democratic Congressman Luis Gutierrez WALKED OUT upon hearing chants of “USA, USA!” It was too much for him. He appeared to be on the verge of tears. Democrats consoled him. To Democrats, it’s now “racist” to love your country. The Democrats’ performance at the SOTU was shocking. Because if they had an ounce of common sense they could at least act like they love America, act like patriots, act respectful to parents of kids murdered by illegal alien gangs. Any sane politician would have acted civil - just to fool enough voters to win elections. Not these Democrats. They suffer from TID - “Trump Insanity Disorder.” They are on tilt. Trump triggers them to acts of self-destruction. They’ve lost their minds. Turn out the lights. There is no one left to support the Democratic Party we saw on Tuesday night, except for illegal aliens, radicals, Marxists, felons and welfare addicts. This was the night the Democratic Party committed political suicide.